Focus is made on simplicity. The camera can be controled with any computer, tablet or cell phone using WiFi. Some parameters are tunables from the web interface. The main (and unique...) page presents a dynamicaly updating (low-res) camera window which allows you to focus the camera, change settings... Once done, the "Take picture" button allows to take a high resolution picture with said parameters. It is strongly advised to install the following on a fresh raspian installation, to avoid compatibility problem. Make sure the raspberry pi is connected to internet (via ethernet) and has been udpdated (sudo apt-get update + sudo apt-get upgrade). 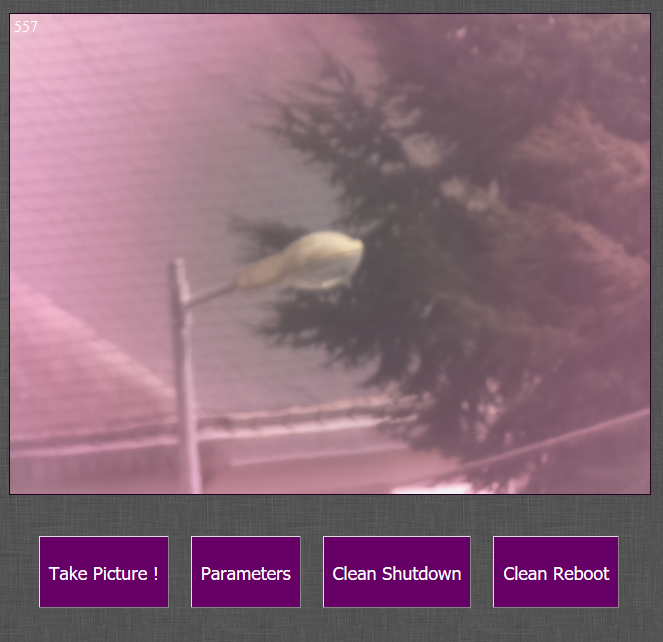 You would also have already activated and tested the camera (sudo raspi-config). It is also advised to deactivate the x-windows interface, to keep only the command line shell, to make the raspberry faster to boot and use (sudo raspi-config, boot options, console boot). Now, you can check, using the LAN, that the website is working. You may first wish to identify the raspberry-pi IP address with the command ifconfig eth0 | grep "inet adr". For an example, my own raspberry-pi IP address is 192.168.1.16. Then, on your computer, open a we browser and check "http://192.168.1.16/". Then, you may with to configure your raspberry-pi as a WIFI Access-point, to be able to work without a LAN, and "in the fields" The best is to follow this other site that explains how to.... Attention, the ip address to lookup the application in Wifi mode will be different from the LAN one, you configure it during the WIFI-AP procedure.